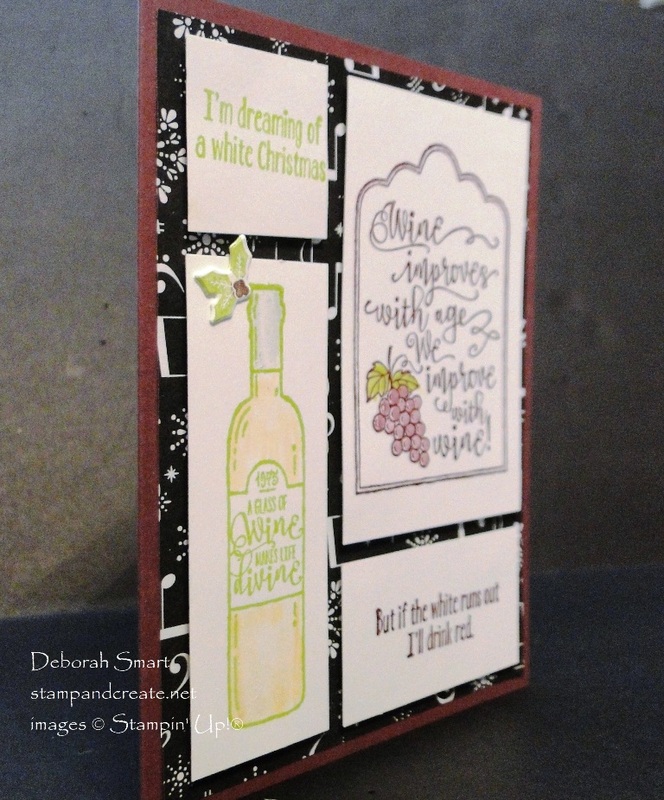 Today I’m sharing another card from my Holiday Catalogue Celebration samples. It’s made using the Half Full stamp set, which of course ties in with the title of this post (see what I did there?). I love the fun sentiments and images in this stamp set – so I decided to show off a bunch of them! I used the same layout for this card as I have for a couple of others; you can see one of them in THIS POST. The measurements for the Whisper White cardstock panels are: 1 1/4″ x 1 1/4″; 1 1/4″ x 3 1/2″; 2 1/4″ x 3 1/2″; and 1 1/4″ x 2 1/4″. The card base is Fresh Fig cardstock; 8 1/2″ x 5 1/2″, scored and folded and 4 1/4″. I added a front panel of Merry Music Specialty Designer Series Paper of 4″ x 5 1/4″, under the white panels. I heat embossed each of the images and sentiments. I was able to do that by first inking the stamp in Versamark ink, then immediately inking in the coloured ink (Lemon Lime Twist for 1 sentiment, and the bottle; Fresh Fig for the 2nd sentiment and tag). After stamping, I then covered the ink with Clear Embossing Powder, and set it with the Heat Tool. To colour the bottle, I used a Blender Pen with some ink from the lid of the So Saffron ink pad – that’s my ‘white’ wine! The grapes are coloured with the Blender Pen and ink from the lid of the Fresh Fig ink pad. To get ink onto the lid, you can either gently squeeze the lid to the ink pad, while the pad is closed, or you can place a drop or two of ink refill into the lid. Once all of your panels are stamped, embossed and coloured, putting it together is easy! All you need is a steady hand, and a good eye for lining up the panels 🙂 I placed Stampin’ Dimensionals on the back of each stamped panel, then placed them onto the Merry Music DSP panel. There seemed to be something missing, but a bow didn’t seem right. Aha – there is a cute little holly image in this set! I stamped that, and added it to the front. Done! 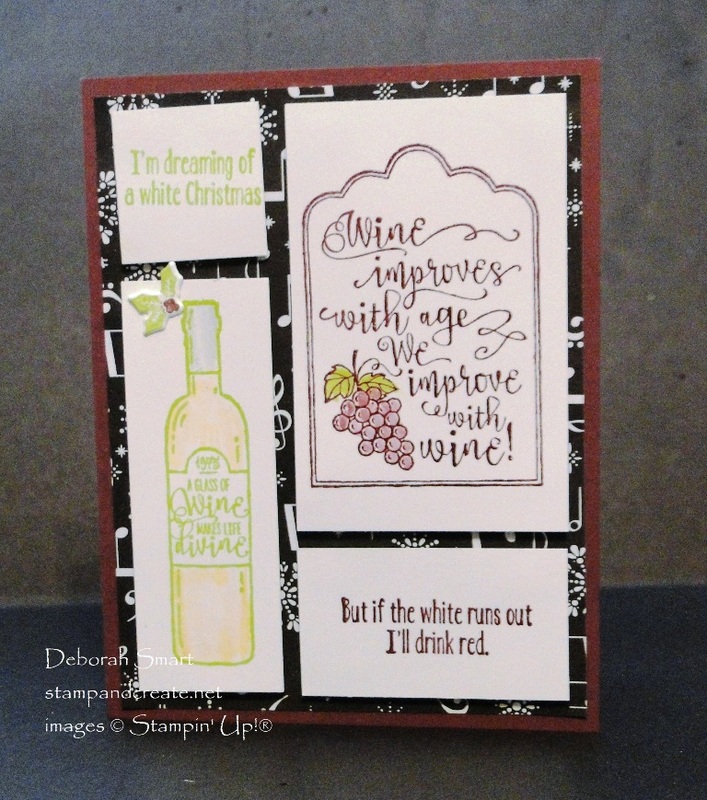 I also used this stamp set on the current Paper Craft Crew challenge – you can see that card in THIS POST, for more ideas! Previous Previous post: NEW CLASSES ADDED-SIGN UP NOW! Next Next post: Only 1 Week to Join! What a fun card! I love the sentiments in this set. (How did I not add it to my first order. ACK! It’s on the way, though.) I don’t drink red either anymore. Well, not much, anyway. It is lovely in the winter by the fire with a nice hearty stew. But I digress. Great card!